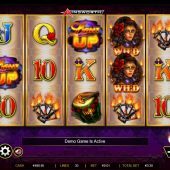 Light em Up slot is an interesting game from our Australian friends Ainsworth. It is based on a theme that appears to be a historical lady figure going to a masquerade ball judging by the symbolism, similar to that of Hearts of Venice by WMS. On the reels there are eye masks, fire lanterns and fiery drums plus flaming swords along with the usual card symbols. The sound effects are standard Ainsworth straight from the land-based version of this slot, with a gentle sound for winning spins and no sounds as the reels spin. There are 30 pay lines over 5 reels and naturally a bonus game can be won. Aside from the symbols described above we have stacked Wilds with no multiplier on the last 3 reels and 'Light em Up' logo scatters on all reels which are the best 5-of-a-kind award at 100x stake. The symbols themselves pay from 10x stake down to 1.67x stake for the lowest card award. The Stacked Wilds (in the form of the Masked Lady) appear more often than not on the last 3 reels which is welcome considering the relatively low pays in the base game but when we understand the feature it becomes apparent why. Jade Emperor and Big Thunder have the same Wild set-up which seems common on the Ainsworth 'King Strike' releases. When you land 3 or more scatters 10 free games are awarded and during these the stacked Wilds only appear on the last reel. Don't be alarmed, as the centre 3 reels all have a Wild enhancement spinner above them plus Wilds now appear on reel 2 as well. There are essentially 6 possible results for each reel which are that an expanding Wild will cover the reel with either a 1, 2 or 3x multiplier allocated or a simple Wild multiplier is displayed at 1, 2 or 3x which will be applied to any Wild which has landed on that reel, but unlike the expanding Wild it will not create a Wild where there wasn't one during the spin. 2 scatters landing will add 5 extra spins too. The ideal spin therefore would be to get all centre 3 reels have the 3x expanding Wild added, of which you get the multiplier product i.e. this would mean a 27x multiplier for any 5 or 4-of-a-kind wins. Given the top paying 5-of-a-kind win is 10x stake, this would become 270x stake and you could get several combinations of it - and therein lies the game's potential!